A secret exit at Hartshead Moor. 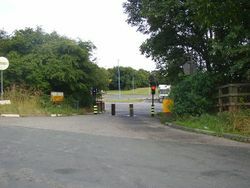 A rear access, better known as a 'secret exit', also known as a 'rear exit' or 'side exit', is a road which allows people to get from the service area to the local road network without using the main entrance (a motorway sliproad). Initially they were very popular and were included in all of the early services, but too many people were using them as makeshift motorway junctions, which neither the services nor the surrounding roads were built to handle. 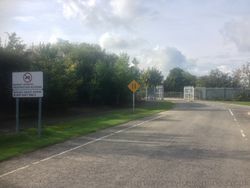 As of April 2008, secret exits are discouraged and new ones should be physically separated from the rest of the service area to stop people using them as a shortcut. 1 Why were they needed? One of the biggest inconveniences with motorway services is that they are often in isolated locations, meaning that staff, emergency services, Highways England vehicles and any other visitors from the local area will usually have to drive to the nearest motorway junction and join the motorway for a couple of miles, and then to get back they have to drive a few more miles in the wrong direction before being able to turn around at the next junction. As well as being a pain, this also creates a lot of unnecessary traffic on the motorway network and can cause problems with the operation of the service area itself, particularly with the emergency services. There is an additional problem with motels often only being located on one side of the road, making it hard for customers on the other side to access them. 'Rear exits' also allow staff to walk, cycle or get the bus to the services. Heavy-duty fencing only works if it's closed. Although there is no specific law against it, there are several legal complications with the public abusing rear accesses, as they are leaving the motorway network without passing any signs to say they have done so. For this reason, as well as the problems with safety and traffic congestion, operators have always been expected to prevent their 'secret exits' from being abused. There are often signs telling people not to abuse them, but very little enforcement has been carried out on people doing so, especially as it's hard to tell them apart from legitimate users. Following pressure from councils and local residents, most operators have introduced rising bollards, barriers or number plate recognition cameras, but again enforcement is rarely carried out and they are usually left out of action. Many of them have been included on Google Street View and some unscrupulous estate agents have been known to use them to advertise a property having good motorway access. This does not mean that it does not happen. There are plenty of police forces who have responded to complaints from residents by deciding they will spend a day waiting at the end of the service road and stopping its abusers. As early as 1961, the Ministry of Transport were complaining about the gates at Newport Pagnell having been left open, and three vehicles being seen abusing it in 10 minutes. This is particularly impressive when you consider how little traffic there was around at the time. One of the most well-known examples of access abuse is at Rothersthorpe, where supposedly so many people were using the services to access the A43 that a junction was eventually built around the services, although it's more likely that a new junction was needed anyway. Keele was the first to get an expensive rising bollard set up to tackle abuse, which was introduced in 1977 - until then a gate and padlock was common. One proposed service area considered on the M1 in the 1960s would have had both service roads bridge a railway line: a considerable investment for an optional extra. Here is a comprehensive list of all the services with a rear access and the road they join on to. Several unbuilt services have been included if it was clear there would have been a rear access. UK services are listed first, with the three Irish examples at the end.